Over the past week, there’s been a huge amount of media interest in the sale of Royal Mail shares. We’ve seen this trend reflected in high numbers of visits to GOV.UK - in fact, at times, almost one in three visitors to GOV.UK was looking for information about these shares. So we thought we’d let you see some of our initial findings on who visited our site, and when. Government first announced the sale of Royal Mail shares on 12 September - but at that time, there was no prospectus and no way to buy the shares, so interest quickly died down. From Friday, 27 September, people could buy shares - and on GOV.UK, we hosted the government’s official online application route for shares. Although there were over 50,000 visits on the first day, interest waned a little over the next 10 days - until Monday, 8 October. 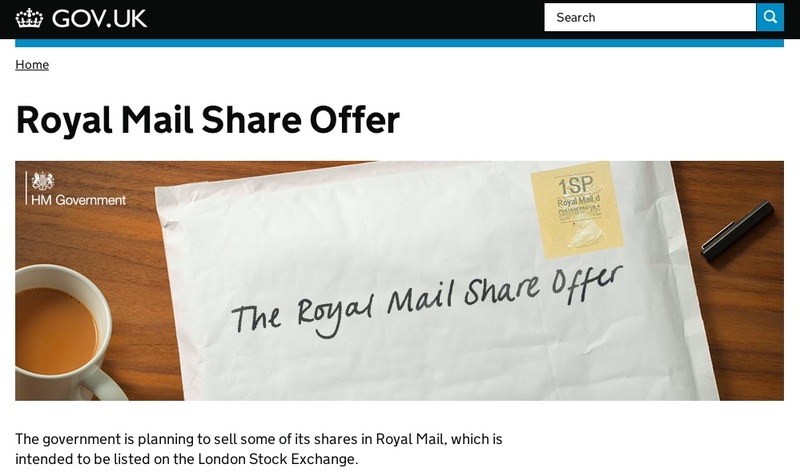 Of the 1.5 million total visits to Royal Mail share content on GOV.UK, around half came in the last three days of the share offer. Visitor numbers peaked at over 25,000 visits on Monday between 10pm and 11pm - an unusual time to have peak traffic, and likely to have been visitors whose interest had been sparked by late evening news programmes. Tuesday, 8 October was the final day the share offering was open to the public, and traffic remained high; and again interest continued through to the evening, finally dropping off towards midnight, the cut-off time for applications. At lunchtime on Tuesday, almost 1 in 10 visitors to the whole GOV.UK site was visiting the share offer page. Almost 95% of visitors to the Royal Mail Share Offer page over those 2 days entered the site on the www.gov.uk/royalmailshares page, with just over half of them coming from Google (54%). This is a much lower percentage of traffic than to the site as a whole (normally between 65 and 70%) and reflects the high number of referrals and direct traffic. The top referring sites were telegraph.co.uk (48,400 visits) and guardian.co.uk (14,400 visits). 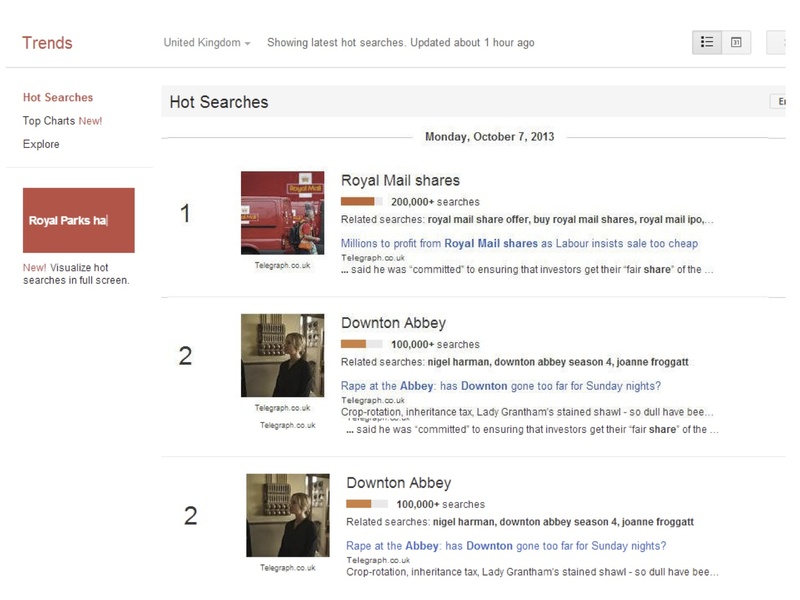 Related search terms for ‘royal mail shares’ were so popular on Monday that it was the number one trending topic for the day on Google Trends, showing over 200,000 searches for ‘royal mail shares’. Shares started trading on the morning of Friday 11 October. And at around 9am, around a third of all traffic to GOV.UK was looking for information on these shares. What’s clear is that this share offer, the first of the digital age, drove a huge number of people to online government channels to find up to date, authoritative, information. I really like blog posts like this showing the search and visit data, thanks. Just wondered, though, when I go to http://www.gov.uk/royalmailshares and click on the green 'start now' button, I am then asked to choose a country, click to continue, then told the share offer is closed. Why not stop me proceeding past the very first 'start now' button? Good point. We'll find out. Hi Andrew. This has now been fixed. Thanks.